Breakfast tacos are kinda the perfect food, since they're just the right combination of nutrition and grease, and they're pretty good on the go. 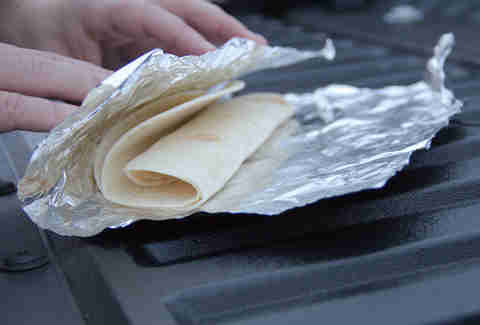 In fact, even if you're in the middle of freaking nowhere, you can cook 'em under the hood of a car or truck and have absolutely perfect tacos the instant you're ready to eat. It's called engine cooking -- not exactly a new phenomenon, but everyone I talk to about it looks at me like I'm insane. 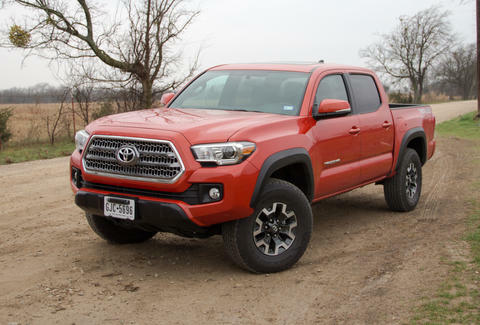 So I cooked up some breakfast tacos in a Toyota Tacoma, partly because that meant I could cook them while having some serious fun on Texas' myriad dirt roads, and partly because I can't resist a cheesy pun like tacos in a Taco. Obviously, most of the food here is the same as any breakfast taco, but you do need to get a little creative for the cooking process. 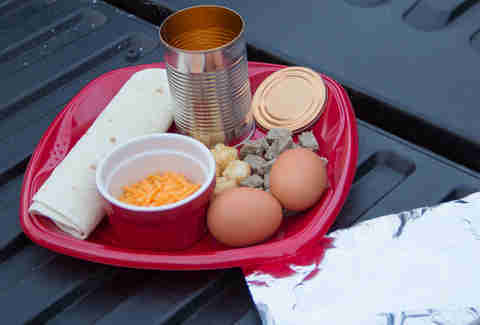 If you've gotten the requisite ingredients gathered, putting them together is ridiculously easy -- crack the two eggs into the can, then toss all the other food (sans the tortillas) in there too, and put the lid back on. You don't have to do this step, but there's probably something wrong with you if you're doing all of this and don't take the extra 30 seconds to get nice, hot tortillas at the same time. The one really annoying thing about eggs is that they'll go everywhere if you don't have a perfect seal, so in addition to the lid, I took the extra step of wrapping some tin foil over the top, and cinching it down with a zip tie. As you'll see in a minute, you'll need that zip tie anyway. Since those eggs are just cracked into the can, you risk having a sunny side-up taco if you don't scramble them; shaking is a crap-load more fun than whisking, just FYI. Bonus: shaking like this also lets you know if you've successfully sealed it all up. You don't want eggs cooking all over your engine. This is where it gets tricky, because where you put your food depends on how hot it needs to get to cook properly, but also on how long you plan on driving. If you're only going on a 30-minute jaunt, you should find a spot much closer to the engine than I did here, because it'll take the engine up to 20 minutes to get nice and hot. The best course of action is to feel around (carefully!!!) 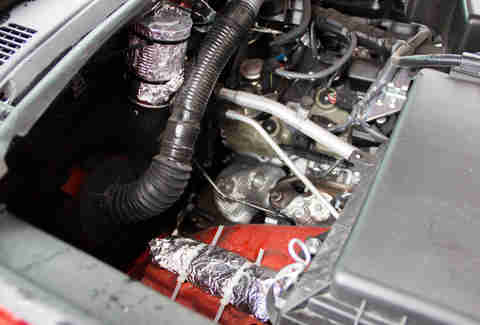 under your hood after you get home from work someday. See how hot different sections get -- the exhaust manifold is a sweet spot for engine cooking. Wedge your food so it won't get dislodged during your drive. Hot dogs, for example, won't leak all over the place if you put them sideways, but for eggs? I took no chances, because I could already imagine the phone call with Toyota's reps. "No no, the truck was great. Yeah. That's egg. I'm a klutz." Pro tip: zip ties are second only to duct tape in the most useful invention ever department. Use them to your advantage here and your food won't dislodge no matter how crazy you drive. Remember how long your food needs to cook, and how far away it is from your engine-slash-heat source. Now, go do whatever it is you do that's fun. To cook tacos in a Tacoma? I hit dirt roads, naturally. Amazinly, I get to say something here without even the slightest hint of sarcasm: "Caution: Contents and Container Will Be Very Hot." If you're not used to poking and prodding around under the hood of your car, just think of it this way: it's hot enough to cook your food. If you wouldn't just grab food off the skillet, don't reach in without a rag or a glove to insulate you from the heat. 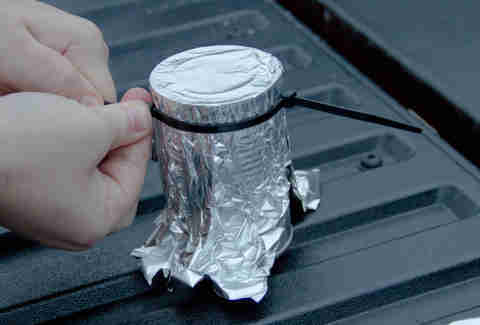 Cut the zip ties and/or de-wedge your food, unfurl a tortilla, and just dump the contents of your can straight on there. You're basically done now. 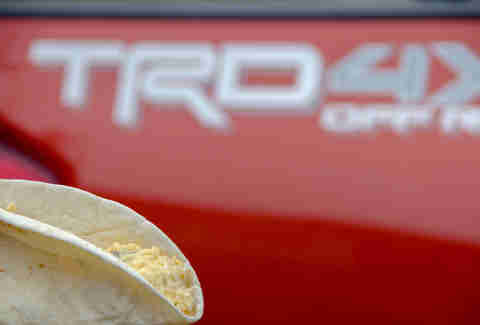 Eating tacos you made with a Tacoma is a wonderful thing, even without the pun. Aaron Miller is the Cars editor for Thrillist, and can be found on Twitter. He's very relieved he didn't spill eggs all over Toyota's Tacoma.